Immigration has always been a hot button issue in US politics, but developments during and since the 2016 election have significantly increased the attention on immigration. Earlier this year, the current administration signed an executive order to suspend immigration to the US from six Muslim-majority countries – a move heavily protested by the tech community. Soon after, another executive order known as “Hire American, Buy American” proposed broad reform to the H-1B visa system. The United States is slated to face a shortage of more than 1.1 million STEM workers by 2024, an issue that may be further exacerbated by limiting access to foreign technical talent. 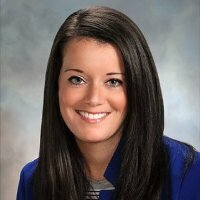 We wanted to dig deeper to learn how the political climate is impacting the international hiring landscape. Because Hired facilitates the job-searching process from first interview request through final offer, we’re able to see patterns in global hiring behavior across both candidates and companies. We have supplemented our own proprietary data with survey findings collected from tech workers who are part of Hired’s platform. Here’s what we learned. 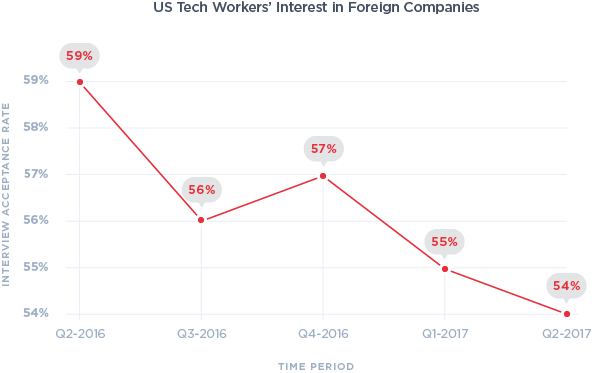 The current political climate has caused uncertainty among the tech industry, particularly as it relates to hiring activity between US-based companies and foreign candidates. 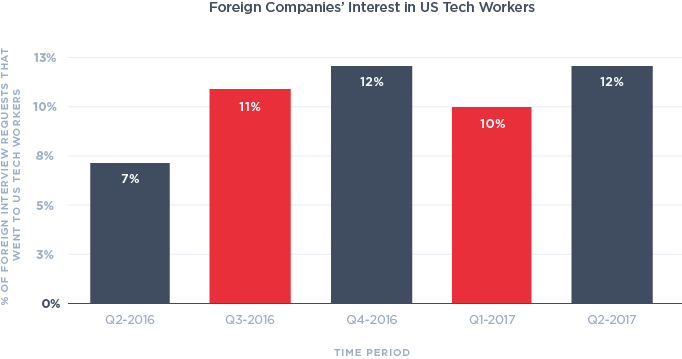 To better understand the impact of the political landscape on the United States’ international tech hiring, we looked at the interactions between US-based companies and foreign candidates on our platform. 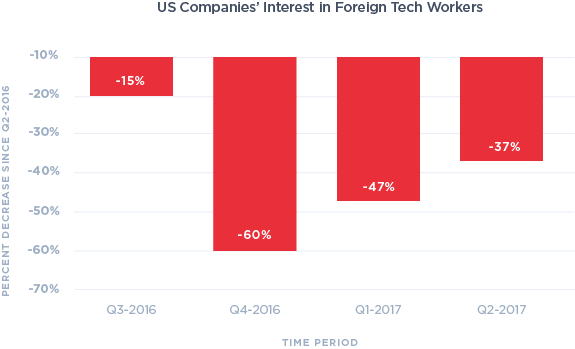 Foreign candidates were also slightly more reluctant to engage with US companies, as evidenced by the 4% decrease in the rate at which they accepted interview requests from American companies between Q3 and Q4 2016. This rebounded more than twofold in 2017. The US tech industry understands the value of foreign talent, but they’re not sure that the H1-B program is the way to find that talent. Forty percent of Fortune 500 companies were founded by immigrants or their children, so it is unsurprising that many in the US tech community support open immigration policies. What’s more, our study revealed that US tech workers also think immigration brings innovation and diversity to the industry. While the H1-B program has been the subject of much debate over the last decade, President Trump’s “Hire American, Buy American” executive order pushed the program into the national discourse once again. 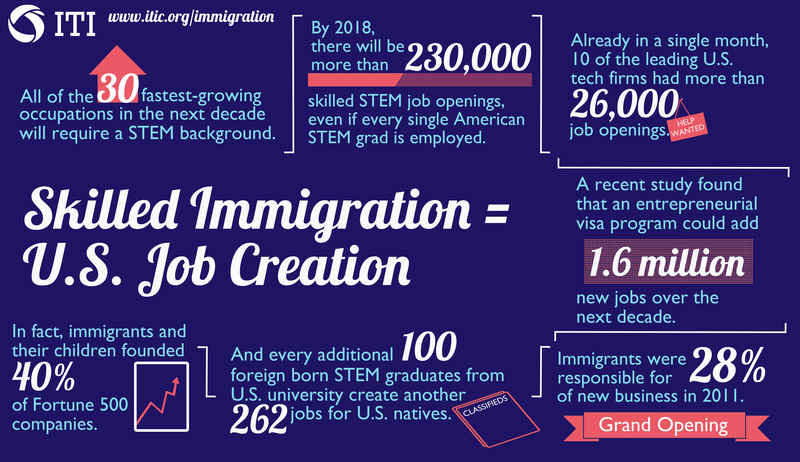 It’s clear that the majority of US tech workers think that immigration makes important contributions to the tech industry, as seen in the graphic above. 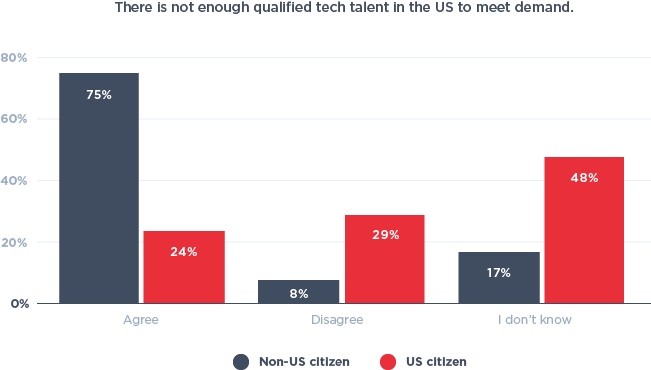 While 55% of total respondents agree there is not enough tech talent in the US to meet the demand, nearly half do not think the current structure of the H1-B visa program is working. 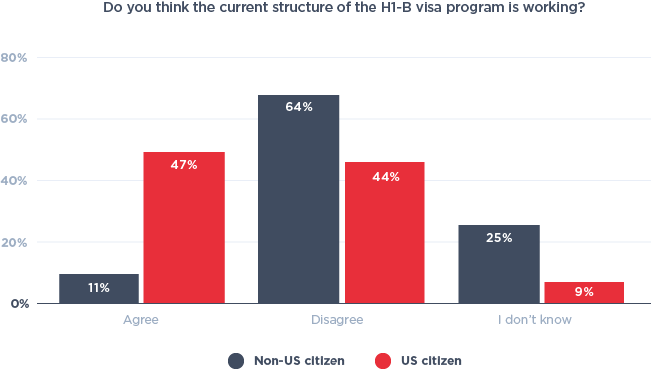 To understand the difference in opinion of the H1-B program, we also looked at the responses by citizenship status. Non-citizens are likely to be more familiar with H1-B processes from their personal experiences. As a result, it is telling these individuals are far more likely to feel strongly that the program is flawed. Though the findings illustrate the issue’s complexity and underscore the need for reform, the exact nature of this reform remains nebulous. President Trump has advocated for prioritization of foreign workers who hold advanced degrees, which was echoed by the respondents in our survey. In fact, respondents indicated that this was their number one suggestion for fixing the program, followed by increasing the number of H1-B visas issued, overhauling the lottery in favor of an auction or other system of allotment, and increasing the minimum salary. The election could have a negative impact on innovation in the US and may lead to loss of tech talent. 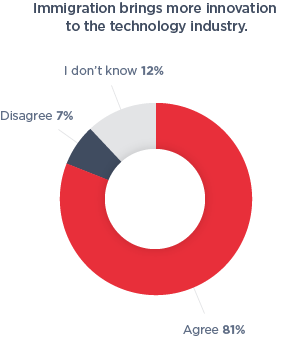 Sixty percent of our survey respondents indicated that they believe the current administration will have a negative impact on the tech industry, and almost a quarter say they are less likely to start a company in the US as a result. 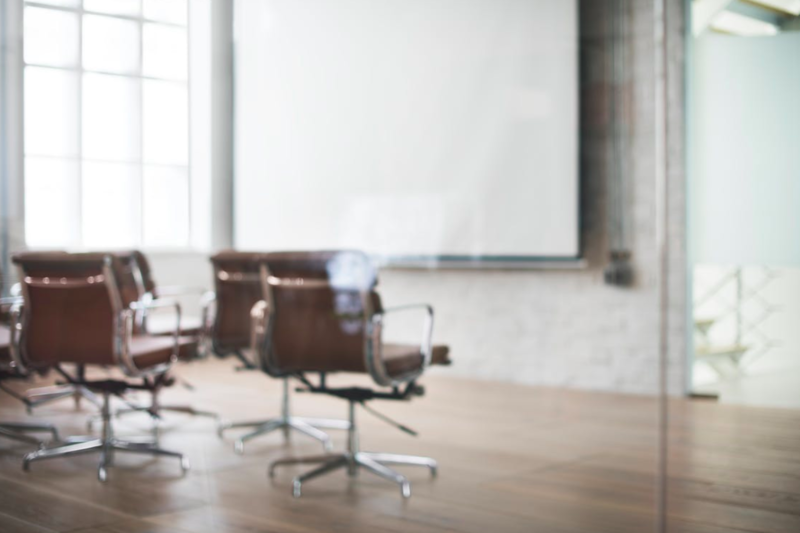 Combined with recently announced plans to eliminate a federal rule that lets foreign entrepreneurs come to the US for the purposes of starting new companies, it all adds up to a troubling outlook for the US’s ability to to retain talent and foster innovation. Forty percent of our survey respondents have considered relocating to another location since the 2016 election. Of those individuals, nearly one third cite Canada as their top choice (32%), followed by Germany (12%), Asia (10%) and Australia (10%). Furthermore, it appears as though Brexit has had a negative impact on tech workers’ decision to relocate to the UK. While 6% of respondents listed the UK as their top choice if they were to relocate, another 43% of respondents said that Brexit had made the UK a less desirable place to live. 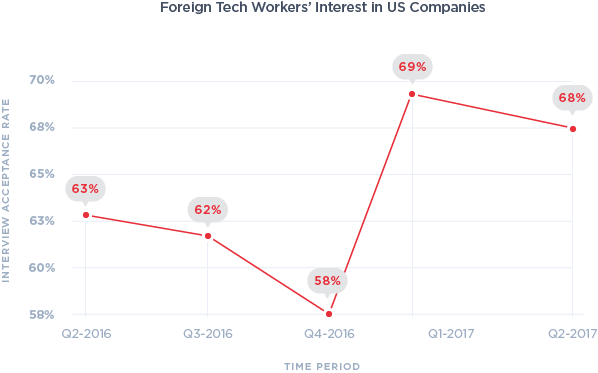 Foreign companies may be trying to capitalize on this sudden interest in working overseas: the percentage of their total interview requests on the Hired platform that have gone to American workers has steadily increased since Q2 2016. Interestingly, however, the rate at which those interview requests were accepted has declined since Q2 2016, with the exception of a small 1% increase right around the election in Q4 2016. As with all of our data, our intention in releasing this report is to understand the trends that are shaping the hiring landscape. Like our recent report on the impact of Brexit on tech hiring, many of the findings in this post are the result of the uncertainty brought about by potential changes in immigration policy in the US and the UK. In both countries, the need for tech talent remains at an all-time high, and if companies can’t rely on foreign workers to help cover shortfalls in domestic supply, we’re likely to see an exacerbation of the skills gap. In fact, we’re already seeing early signs pointing to this trend, as the number of interview requests per user on the Hired platform has steadily increased in recent months. Combine this with the fact that the VC market is on the upswing after a massive contraction that started in the back half of 2015, and we could see a severe talent crisis as companies pump more money into hiring. For now, US immigration policies are still in flux, so it’s too early to predict just how events will play out. That said, there is at least one thing to feel optimistic about: it appears that the the conversation around immigration hasn’t impacted foreign candidate interest quite as strongly in the US as it has in the UK. While we saw foreign candidate interest in UK-based companies drop by 20% following Brexit, the same stat dropped by just 4% in the quarter following the US election, and has since rebounded to figures that are higher than they were pre-election. 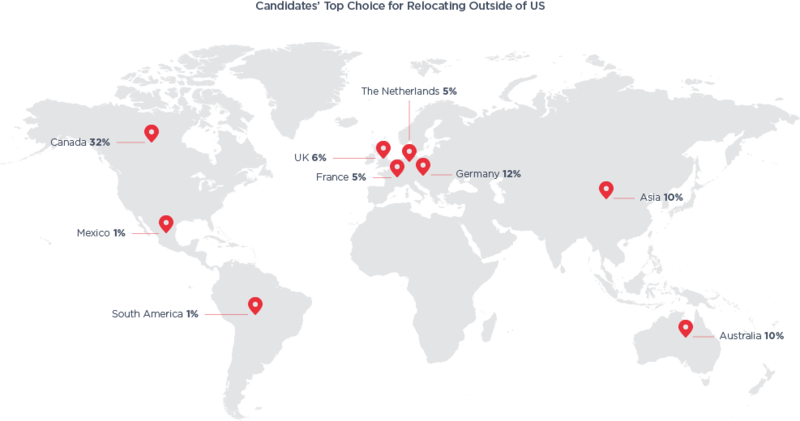 From this it’s clear that the US remains an attractive place to work for tech talent from around the world. What’s less clear is whether we’ll be able to welcome them to work among us. 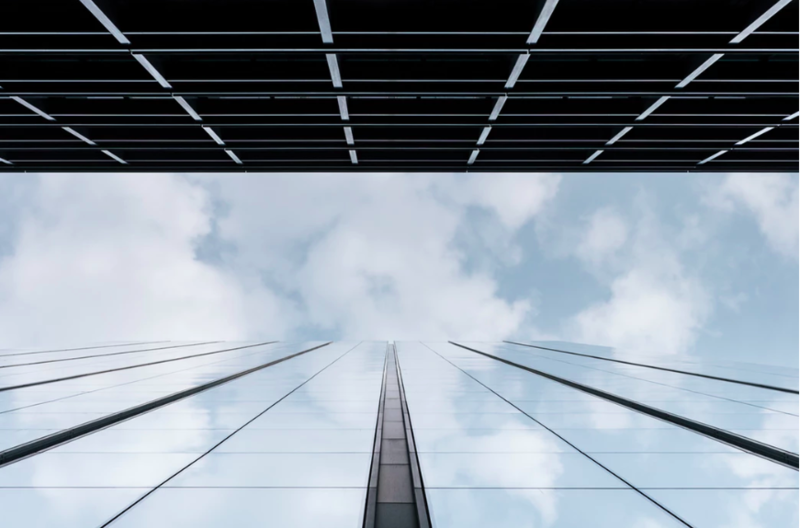 At Hired we remain committed to facilitating the global flow of talent and connecting companies with skilled talent, foreign and domestic.